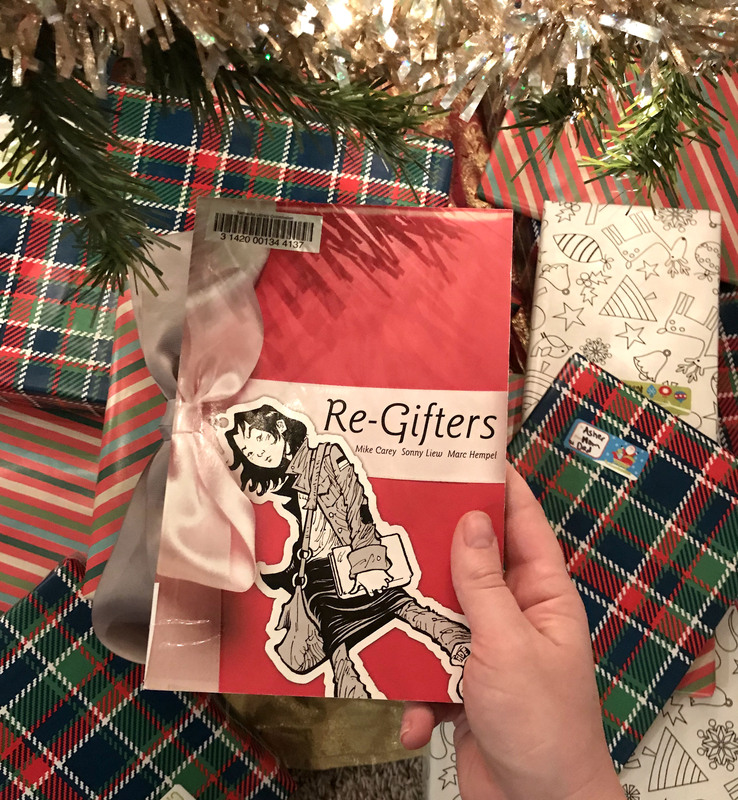 Today’s #BookFace is both a book club kit title and the 2018 One Book for Nebraska Teens selection! 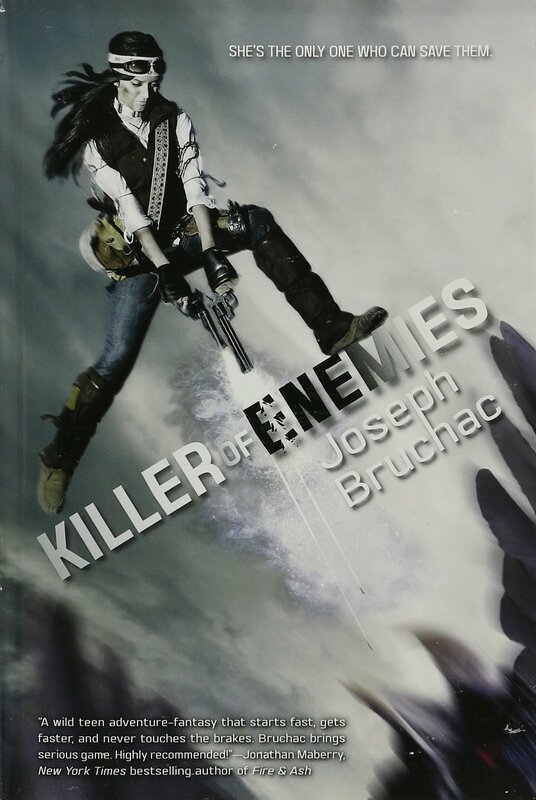 We got creative with “Killer of Enemies” by Joseph Bruchac (Tu Books, 2016) and used the back of the book instead of the cover. 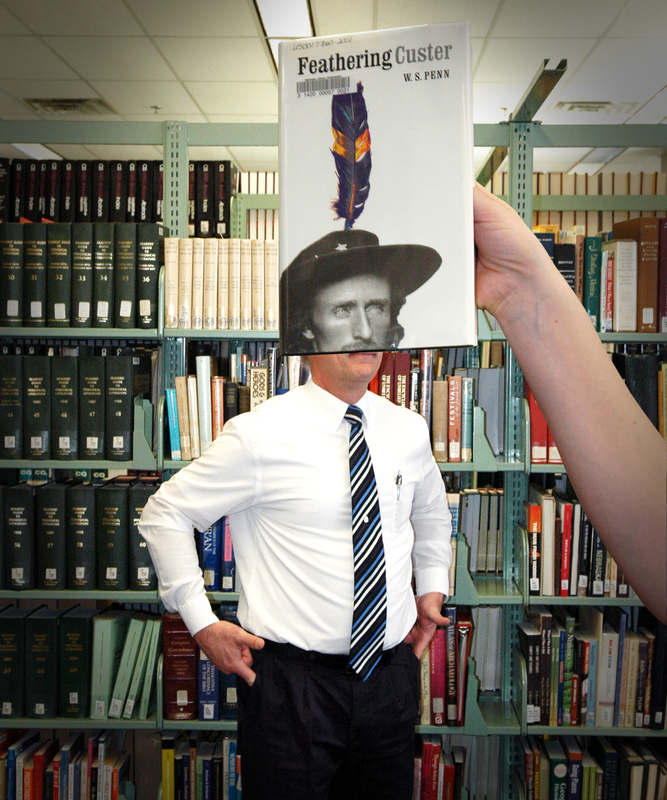 We just couldn’t resist it’s BookFace perfection. It’s available for your teens’ to borrow as a book club kit through your library! Joseph Bruchac is a highly acclaimed Abenaki children’s book author, poet, novelist and storyteller, as well as a scholar of Native American culture. 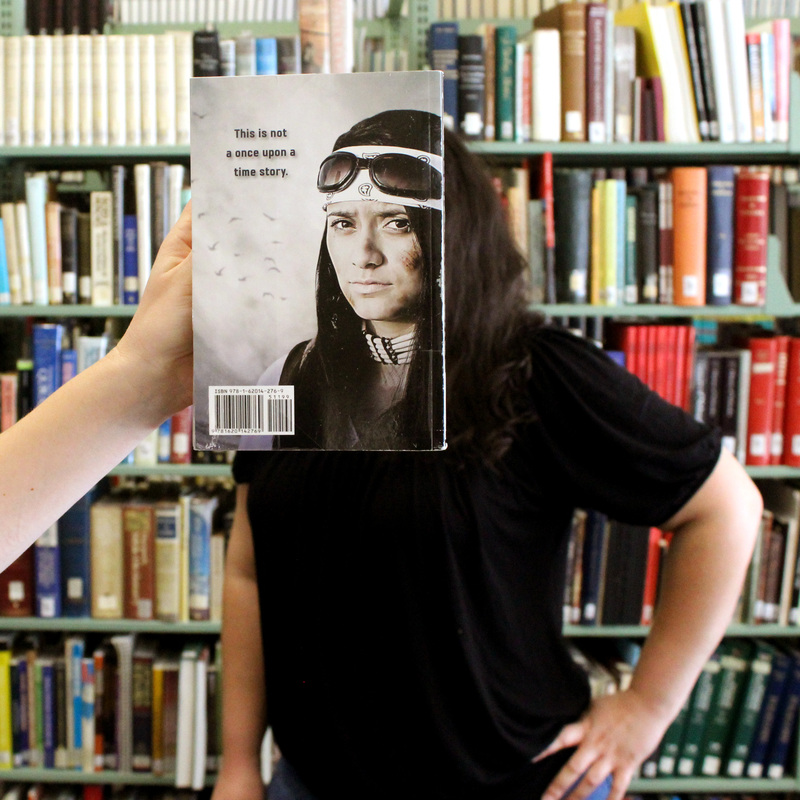 This week’s #BookFace model is our new Technology Innovation Librarian, Amanda Sweet! We like to celebrate the end of the week with #BookFaceFriday! Today we also get to celebrate the beloved Nebraska author Mari Sandoz with “Letters of Mari Sandoz” edited by Helen Winter Stauffer (University of Nebraska Press, 1992). Included in the book are over nearly forty years—from 1928 to 1966—of letters. Dive in to Sandoz’s world as she documents her own experiences, struggles, and successes. As part of our permanent collection it’s available for check out to anyone. Just ask our amazing Information Services staff! This title is published by the University of Nebraska Press, which we collect from for our state document program. This week’s #BookFace model is TBBS Volunteer Services Coordinator, Annette Hall! Hey, book lovers! Happy #BookFaceFriday! As we dive in to our permanent collection, which dates back to 1972, we’re bound to find some gems. 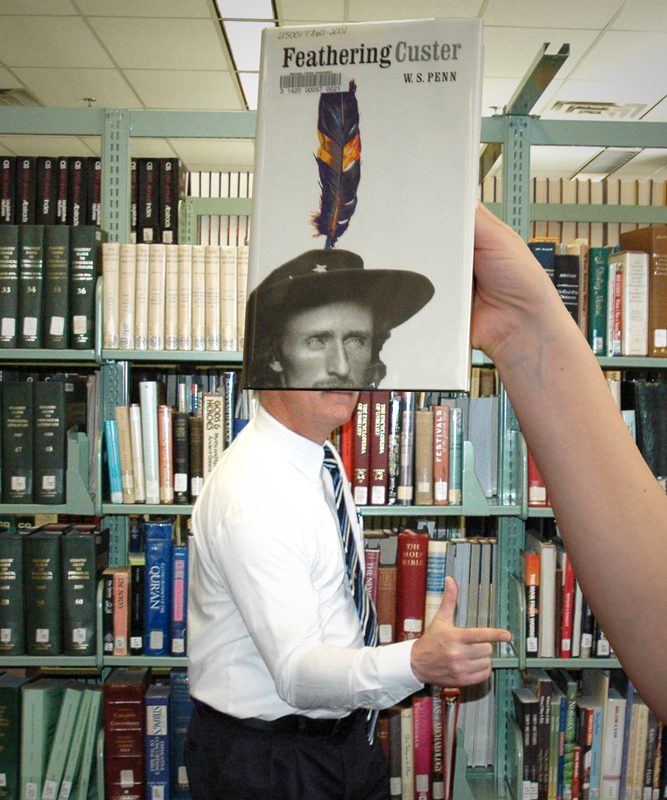 One such book is “Feathering Custer” by William S. Penn (University of Nebraska Press, 2001). As part of our permanent collection it’s available for check out to anyone. Just ask our amazing Information Services staff! This title is published by the University of Nebraska Press, which we collect from for our state document program. 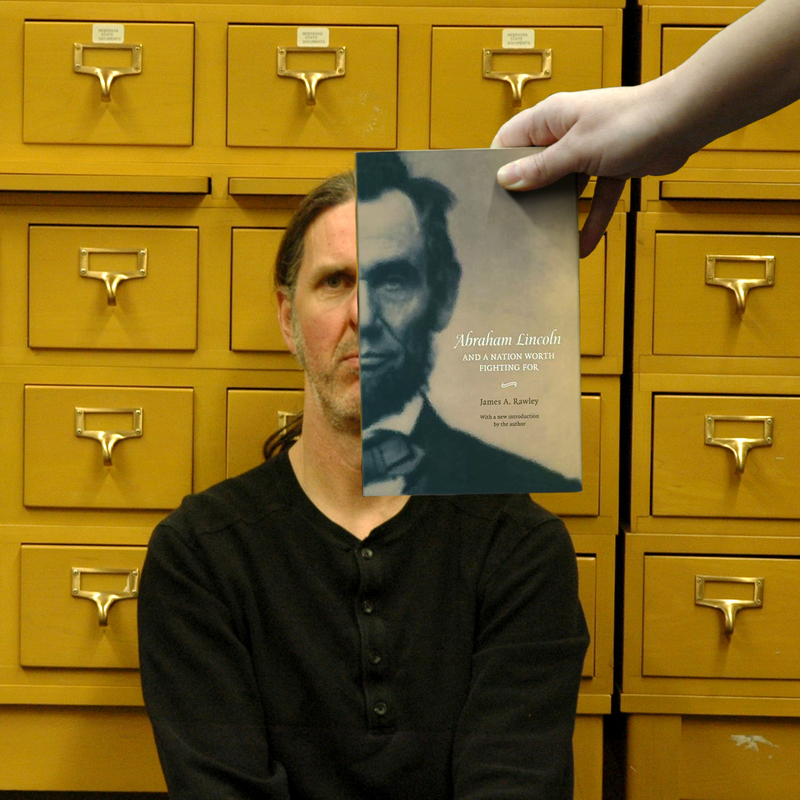 This week’s #BookFace model is Tom Rolfes, Education I.T. Manager at the Nebraska Office of the CIO/NITC. He’s been at the Commission a lot lately working on the grant project “Nebraska Schools and Libraries—Breaking the Ice and Igniting Internet Relationships.” You can learn all about it on the January 24th episode of NCompass Live. Here at the Nebraska Library Commission, we talk about books A LOT. Surprised? Nah, we aren’t either. Last week, Lisa Kelly and I chatted with our Online Services Librarian, Susan Kniseley, about our respective habits of tracking our books read, how we got started, and why we continue to do it. LK: I started about 15 years ago when I made a new year’s resolution to read a book a week, because I wanted to be more intentional about my reading habits and to note my accomplishment when I finished. I use an Excel spreadsheet to keep track of my books. You are SO NPR Susan! AO: I track primarily through Goodreads because it was used by a reading group I was in. I’ve been doing it for about 6 years. I am sure I used to keep paper lists earlier in life, but only sporadically. This year I am also going to track in my bullet journal (a customizable planner/diary/to-do list). SK: What sort of information do each of you track about the books you read? Do you just list title/author, or do you include more information, like number of pages? Do you rate it? LK: Over the years, I’ve definitely increased the number of audio books I consume – so I note when I read text vs listen, when I finish,if it was for a book club assignment and if it was part of series. No page numbers, no ratings, but I do include if someone recommended it – or other facts I think are important – like if my co-worker Susan and I read it together. AO: I keep track of why I’m reading them on Goodreads, through the various “shelves” you can designate – if it’s for Golden Sower, reading aloud to my kids, something I need to know more about for reader advisory purposes, books on parenting, etc. Also the date I finished. I don’t designate audio versus print – I can’t tell the difference in my mind once I’m done. I do rate books, but I don’t worry about page numbers. And I’m a generous book-rater – I like most! LK: No data collection of any sort- I just list the books so I can keep track, and note if I’m running behind and need to crack the whip to hit 52 before 12/31. SK: And Aimee, is there a rating system you use in Goodreads, or do you make up your own? Do you write comments? AO: They have a 5 star rating system, with 3 being “liked it”, 4 “really liked it”, 5 “loved it”. I am not even sure what 1-2 are because I don’t use them. If I’ve finished a book, I like it well enough to read to the end. I don’t write comments often, but I love to read them! LK: Are you two aware of other folks who keep book lists? AO: I have a lot of friends (real-life friends) that are also on Goodreads, so it’s nice to see what other people are reading at the same time. LK: Does that affect your reading selections? AO: Reading selections, no – I will note if they’ve read something I’ve already read, but I don’t usually get my ideas from there. LK: Do you think it’s a boastful activity? The list keeping? Or do others view it that way? AO: Sometimes, sure, but it’s generally just like everything else on social networking these days – we just overshare. And I think anything that encourages reading in our over-scheduled world is good – even boasting! SK: Not necessarily boastful. And I knew Lisa kept a list, but I don’t recall her ever saying anything about it in terms of number of titles read. LK: LOL — I don’t tell many people that I keep track. When I asked my book group if they kept lists, they said no – but concluded it would have been helpful when they started reading a book they’d already read (or already purchased). I do consult my lists when I’ve had to (gasp) skip over series titles (Jack Reacher) and need to fill in the blanks. SK: I follow a vegan cooking person who I don’t know personally. She never talks about much except vegan cooking, but every year she posts a list of books she’s read. It’s neat to see this different aspect of her life. LK: I like that Susan – it is a bit of a thumbprint of sorts, don’t you think? AO: Agreed – it’s not why you follow them, but it does make them more human in your mind. SK: It’s nice to know people read in their private life. LK: It’s a bit like looking at someone’s books on their shelves when you visit their house. SK: So Lisa mentioned keeping on track to reach 52 books by 12/31. Do you both have reading goals? If so, how have they changed? AO: I did a Goodreads annual challenge several years ago, and have done one ever since. It used to be 100-120 books a year, but the last two years I’ve dropped back to 52-60. SK: So here’s another thing I wondered about. Has the act of keeping a list had any impact on your reading life? Has it changed how or what you read in any way? AO: Well, other than reading an occasional poetry book just for a quick score on my tally, I don’t think it has. I started keeping track because I needed to read certain books for the Golden Sower committee, but I would have been reading those regardless, and my “adult” book preferences haven’t changed. LK: I can’t say the list has changed me – being in a book group has pulled me in different reading directions – but I feel satisfaction in looking at old lists and one one book can often naturally lead to another, i.e. Ruth Bader Ginsberg lead to Gloria Steinem. Richard Miller and I both said this last night at book group, age has lead us to read more bios, more nonfiction, and I’d say that’s true for me. But, I still adore my series authors. SK: So when you look back over your entire list, stretching back several years, do you find anything noteworthy? Do you notice trends or changes? Does it seem to reflect anything in your life? LK: Probably nothing worth putting into a paragraph other than the satisfaction of keeping a goal for many years – and that feels a bit like getting an A on your report card. AO: My interests have changed – more books about parenting now (or complaining about parenting might be more accurate? Mommy-lit rather than chick-lit). SK: So Aimee, do you feel the same satisfaction with hitting a goal that Lisa feels? In terms of number of title read in a year? AO: I did when I read 100-120. I felt rather lazy last year with only 52 (I think I actually read 60 or so). SK: So do you both record every single book you read? Or do you occasionally leave something off your list? If so, why? LK: Since my lists are private – I don’t leave anything off. I think the act of the list is rather like a report card, showing progress, and a type A person like me gets enjoyment out of the process of tracking something. AO: I can’t think of the last one I left off the list; I am pretty sure I list them all. Sometimes there is a book that I feel self-conscious about reading for whatever reason, but I figure no one is paying any more attention to what I’m reading than I am to their lists. SK: That’s one of the reasons I stopped using Goodreads – I’m sure I could have figured out privacy settings, but I didn’t want to take the time, and I wasn’t sure I wanted all my books showing up to “friends” that I might not know well. LK: Aimee – do you think you’ll always keep book lists? AO: In one way or another – I enjoy having the history to look back on. Thanks for reading through our ramblings! Do you keep track of your reading, online or elsewhere? Feel free to leave us a comment and join in the conversation. Relax everyone, it’s time for #BookFaceFriday! We decided to change it up a bit this week and choose a book from our permanent collection. We absolutely loved the cover on Susan C. Seymour’s “Cora Du Bois: Anthropologist, Diplomat, Agent (Critical Studies in the History of Anthropology)” (University of Nebraska Press, 2015). As part of our permanent collection it’s available for check out to anyone. Just ask our amazing Information Services staff! This title is published by the University of Nebraska Press, which we collect from for our state document program. In 1972, the Nebraska Legislature created the Nebraska Publications Clearinghouse. Its purpose is to collect, preserve, and provide access to all public information published by Nebraska state agencies. This week’s #BookFace model is Kay Goehring, NLC’s Talking Book & Braille Service Library Readers Advisor/Senior. 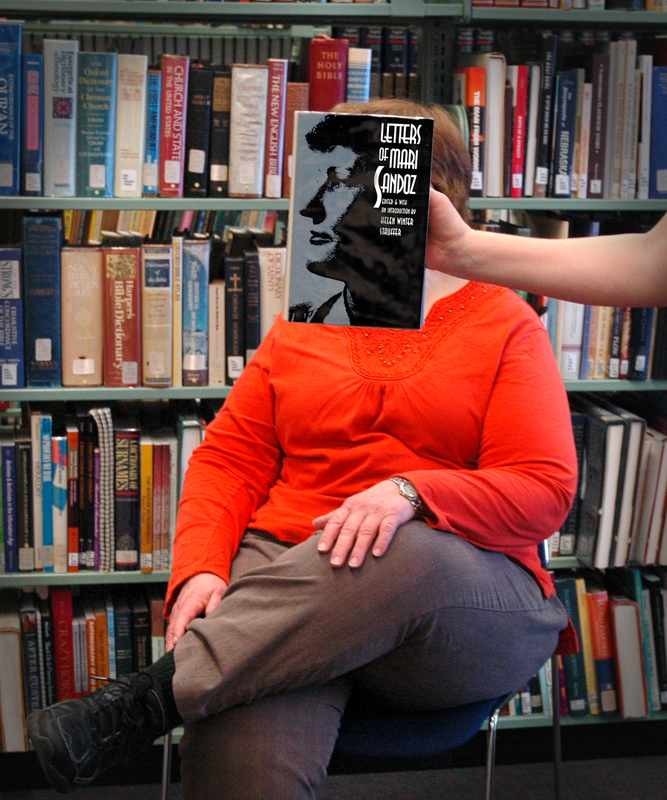 This week’s #BookFace model is Devra Dragos, NLC’s Technology & Access Services Director. 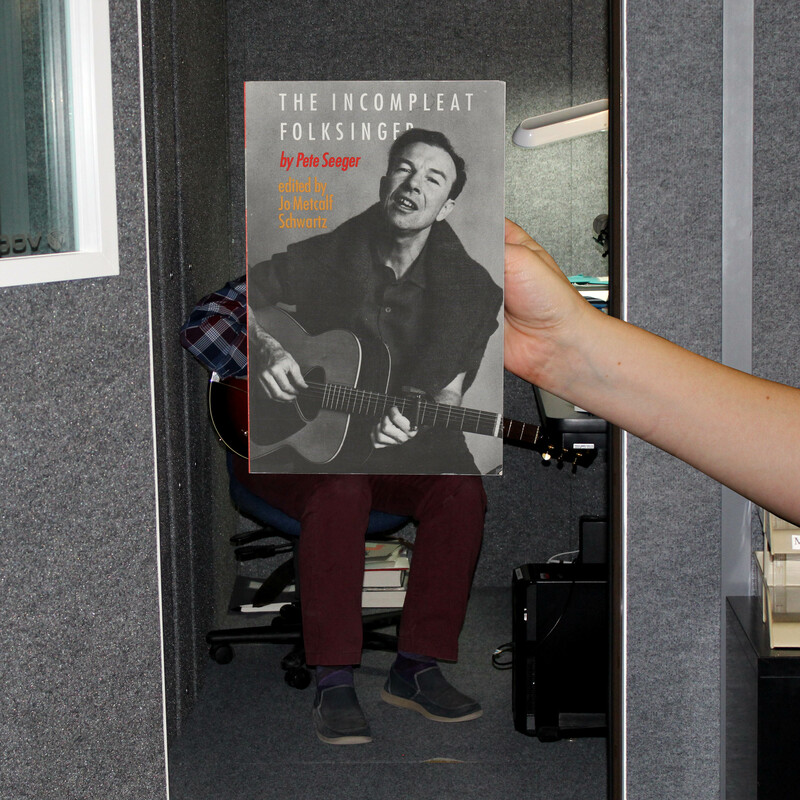 We’ve got a double #BookFace for you today book lovers! I know the new year is supposed to be all about starting new goals and breaking bad habits, but we decided to put that off for one more week. Besides, my New Year’s resolution is always to read more books, and I was probably going to do that anyway. 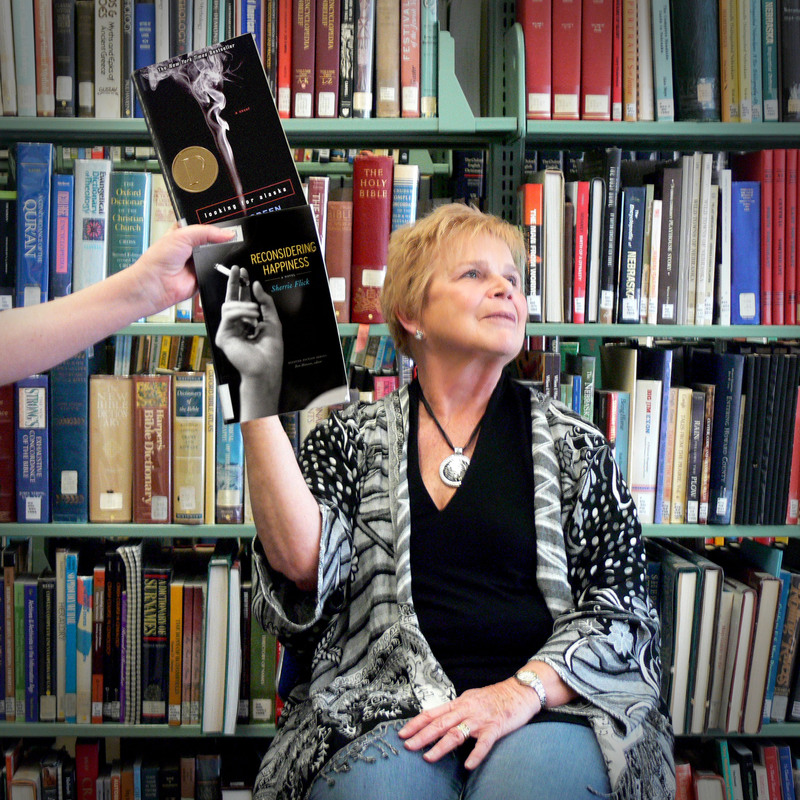 This #BookFaceFriday we decided to indulge in a bad habit instead with John Green’s “Looking for Alaska” (Speak, 2006) and “Reconsidering Happiness” by Sherrie Flick (Bison Books, 2009). Both novels have 4.5 – 5 star ratings on Amazon and are available to borrow as book club kits through your library! 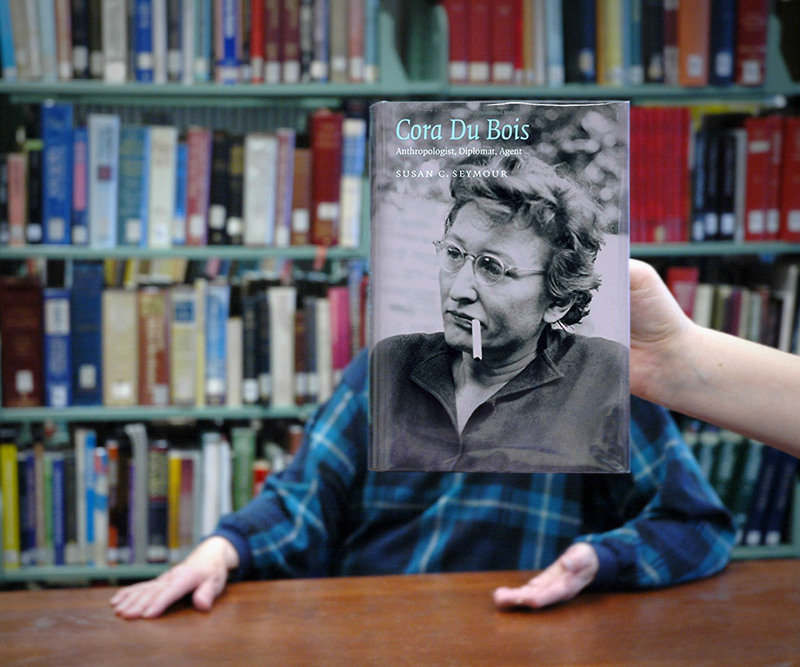 Happy #BookFaceFriday from the Nebraska Library Commission & have a Happy New Years! When a novel just sounds like too much commitment, the perfect solution is David Sedaris’s collection of short stories! 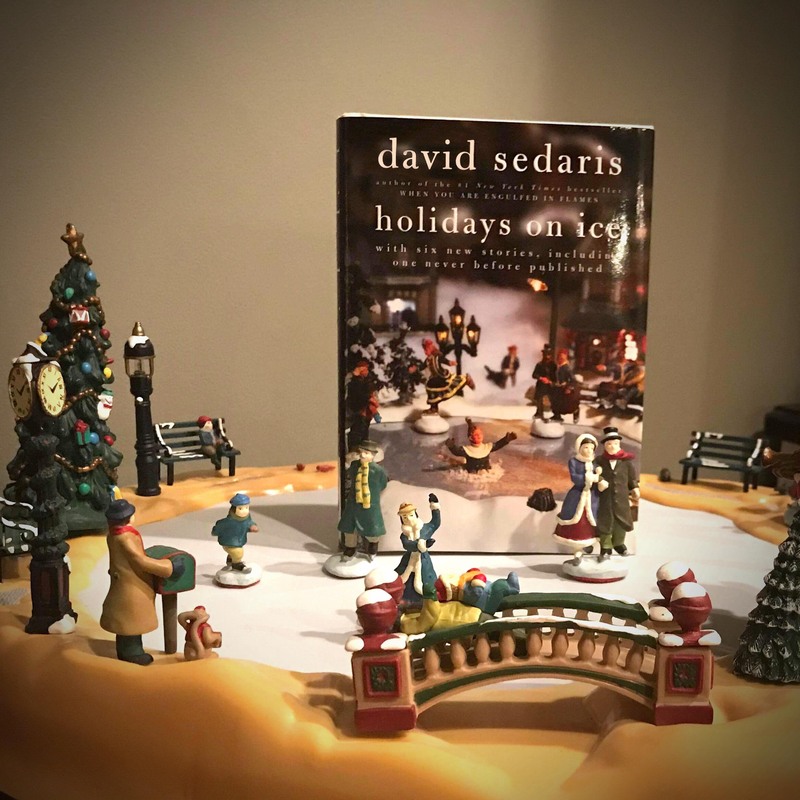 “Holidays on Ice” (Back Bay Books, 2010) covers all our favorite holidays with this great collection of witty stories. Check it out for your book club today! This week’s #BookFace took a trip to Omaha to visit Aimee Owen’s Christmas Village! 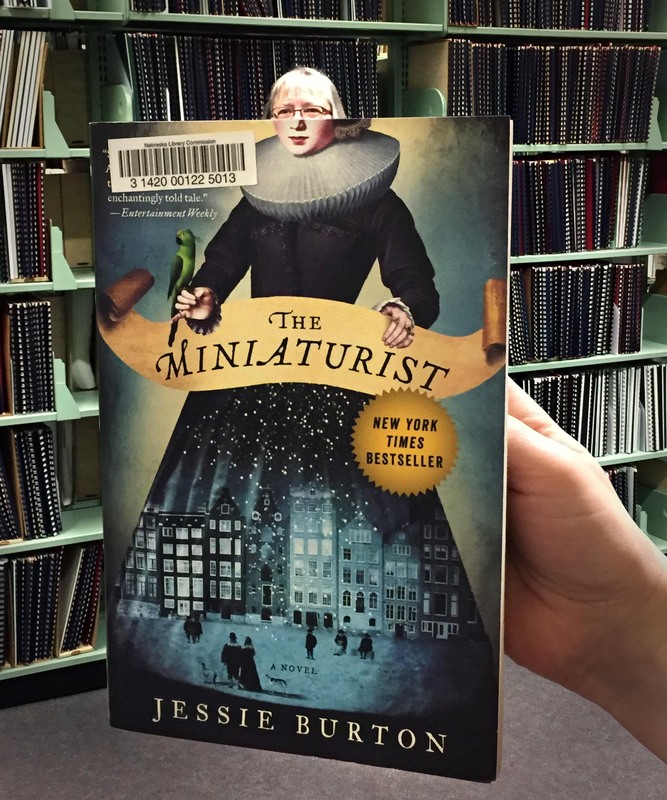 We’re feeling all the warm-and-fuzzies with this week’s #BookFace. Settle in and get comfy with this book club selection. A story about friendship, loss, and love, with a little mystery thrown in, “The Myth of You & Me” by Leah Stewart (Three Rivers Press, 2006) has it all. “The novel unfolds at an unhurried, graceful pace, moving through flashbacks and memories.” – School Library Journal. 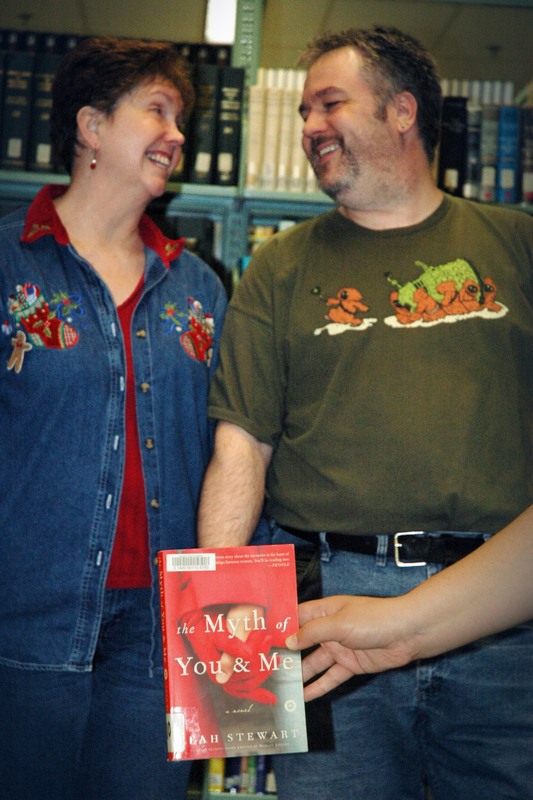 This week’s #BookFace models are NLC’s Government Information Services Librarian, Mary Sauers and her hubby Michael Sauers (Michael used to be NLC’s Technology Librarian, and is now Director of Technology at Do Space!) Talk about a library power couple!